Currently, I’m on my fourth Lydiard-based training plan from the Lydiard Foundation’s Running Wizard website as I prepare for the Berlin Marathon in September, and I couldn’t be happier. Sure, we’ve known each other for a while now, so I always know what’s coming, but it’s such a deep, caring, mutual friendship and how about we put this metaphor out of its misery and I just tell you why I love it? Who is this Arthur Lydiard guy? Arthur Lydiard was amazing! I mean, I never met him (he died in 2004, aged 87), but I just love a good underdog-goes-against-the-grain success story. Lydiard dropped out of high school at 16, so he didn’t have any formal education in sport science and he only started running seriously when he was 27. His story is fascinating. In a nutshell, Lydiard realized that the way runners trained at that time – basically, running hard all the time – was silly non-optimal. So, in a process of self-experimentation and learning by doing, he invented periodization in running: building the aerobic base with easier-effort mileage before adding speed and sharpening to peak for a goal race. Today we take it for granted that this is one of the “right” ways to train; it’s even taught at USATF coaching certification seminars. Many of the most commonly used training plans are based on Lydiard’s principles and exercise physiologists can even tell us why it works. 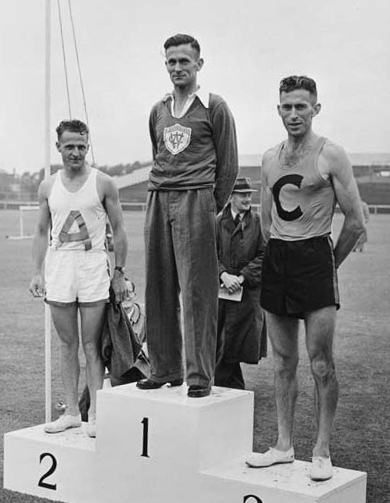 But when Lydiard was starting out, his ideas were revolutionary and there was no exercise science yet to back him up, just the proof of his own performances (he became the New Zealand marathon champion) and those of his athletes. Fun fact: Lydiard is also credited with inventing the jogging trend. Yep, jogging for fitness started in the 1960s in New Zealand when Lydiard started advising a group of sedentary, overweight men who’d suffered heart attacks but wanted to start running. Eight months later, seven of those men finished a marathon in about four hours. If you’ve ever had to bite your tongue and smile politely as that guy at work chuckles that he only runs if someone’s chasing him, you might get a kick out of Jogging the Lydiard Way, in which he does not mince words on the topic of sedentary lifestyles. Periodization? But isn’t Lydiard Training that thing where you run 100 miles a week and you only run slowly? There’s a lot more to Lydiard training than lots of “steady” running. Figure 1 illustrates the phases of Lydiard training, culminating in peak shape for your goal race. The longest phase, Aerobic Base Building, comes first. This is where people seem to think it’s all about running very slowly all day long, but it isn’t! You can run fairly hard and still be running aerobically. The main runs in this phase encompass a wide range of paces, from the tempo-esque “out & back” workouts to time-on-your-feet-paced long runs. The next phase, Hill Training, is meant to strengthen your legs for the harder interval training that follows. Anaerobic Development involves one or two interval workouts per week. Lydiard concluded that you only need 4-6 weeks of interval work to achieve all you can in one particular phase. Integration focuses on dialing in to your race pace, and sharpening your legs up to run fast. For marathon training, I’ll do two runs per week at marathon effort (one of 4-5 miles, and one of 10-13 miles) during the integration phase. Finally, the taper cuts back on distance but keeps some intensity in the form of short “out & backs” and leg-sharpening 100m workouts. For in-depth discussion of Lydiard’s training principles, the book Healthy Intelligent Training: The proven principles of Arthur Lydiard by Keith Livingstone is a good source. Lots of variety makes a happy Caraway! Back-to-back “out & back” and long run workouts: The weekly combination of a medium-long marathon-effort “out & back” run (so named because Lydiard advised doing the workout on an out & back course) followed by the long run makes you tired and very fit. Longest run 15 weeks before the race: This is a consequence of the pyramid I talked about above. When the focus of training shifts from aerobic base-building to increasing speed and stamina, the long run is de-emphasized. The idea is that your weekly mileage is enough to maintain the aerobic fitness built at the beginning of the plan, so after the aerobic phase the long run drops to around two hours. For me, that’s 12-13 miles. A mix of paces, daily distances, and effort levels = low training monotony and good balance: The daily distances in this plan range from a 3-4 mile jog at 10:30 per mile pace, to a long run at 9:30, to an out & back at 8:30 and a fartlek with strides and sprints mixed in. The mixture keeps my legs from feeling stale and there is a distinct mental advantage to knowing every run has a specific purpose. Everyone is different, obviously, but I thrive on the variety and wilt under training regimes where the shortest run is still an hour long. Have you ever trained the Lydiard way? How did it work out for you? oooohhhh…. now I’m intrigued! Gonna have to do some more reading up on this! Super intrigued as well… wonder what my coach Catnip thinks?? I have done one training cycle using the Lydiard method and dropped my marathon time significantly- Down to 2:57! Wow!! That’s fast. So did you do the whole shebang with the 100 mile weeks? So I was intrigued enough to shell out the $ for the personalized plan from the Running Wizard… glad I did! First of all,there’s no 100 mile whole shebang. You can indicate how many days per week you want to run, how many weeks before your race, and you provide some details about yourself and previous race results. I’m 18 weeks out from my next marathon, and the plan it produced for me looks really great. Looks like it peaks around 55 miles per week (most weeks in the 40-50 range) running 5 days per week (perfect for me, as 50-ish is my sweet spot and I like to cross train). There are all different kinds of runs – similar to what you’d find in any other plan – but I like the variety and the change of focus throughout the phases (although to be fair, you are doing speedwork, threshold work, long runs throughout, just like with any other plan – it isn’t remarkably different). I was pleasantly surprised to see the de-emphasis of the long run (hooray!). Overall, this seems like a really great plan, with a nice, sensible progression and lots of variety to keep me interested. Think I’m gonna give it a go this time around and see what happens… Glad I saw this post! That’s great! I hope you like it. Let us know how it works out for you!